This event is being organised to commemorate the 100th Anniversary of the formation of the Royal Air Force (RAF). 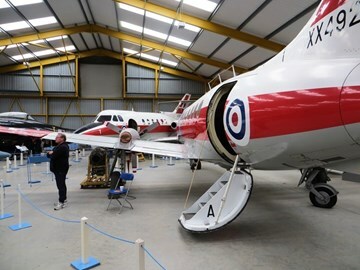 In addition to giving visitors the opportunity to view the cockpits and interiors of many of the museum’s collection of RAF aircraft, cockpits and CIMs; the event will also feature a host of visiting displays. N.B. The cockpits and aircraft may not be open at all times during the day and access will depend on the availability of our team of volunteer cockpit openers. A small additional donation will be requested for access into the aircraft and cockpits. Note to exhibitors from the Museum Groundsman: "Could I ask that when exhibitors arrive that they are not directed over the grass area between Hall 1&2 as with the heavy rain it will soon become a mess." The event is taking place on Sunday 1st April, 2018 – 10am until 5pm (last admission at 4pm). The event is open to everyone and normal museum admission rates will apply: Adults £9.00, Over 65s £8.00, Children £4.50 and Family ticket [2 adults & 3 children] £24.00. Please telephone 01636 707170 if you require any further information. The museum is open 361 days a year everyday except Christmas Eve, Christmas Day, Boxing Day and New Years Day. March to October 10am - 5pm, November to February 10am-4pm.